Finally, the dawning of the converted-to-3-D Star Wars cycle! 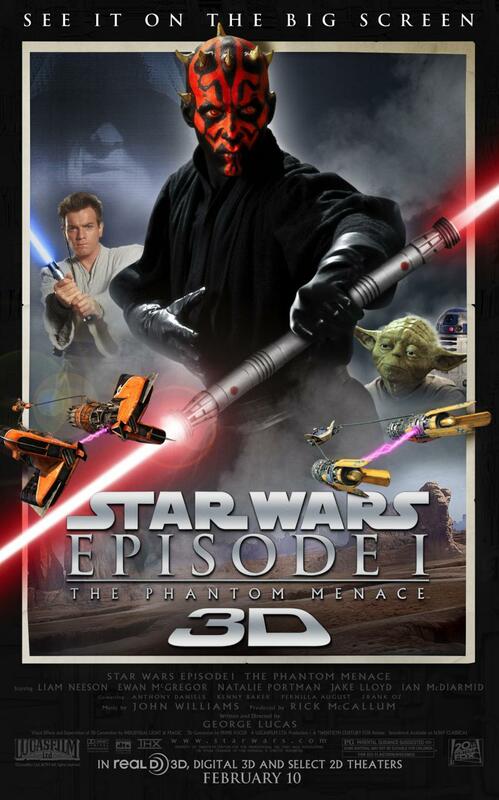 Very few Star Wars fans (this one included) would list Episode One: The Phantom Menace as one of their favourite movies – or even one of their favourite Star Wars movies, for that matter. It’s too long (even that pod race seems interminable), and there are no characters that we can really latch onto and relate to. There’s a whole sect of fans that has a feverish agenda against the Jar-Jar Binks character, though I can’t say that I feel that strongly (either way) about the poor, much-maligned creature. Let’s bear in mind that this isn’t the first ‘cuddly’ that Lucas has produced. After all, in the original trilogy (i.e. Chapters 4, 5 and 6), we had the furry and rather loveable Chewbacca, didn’t we? But I’m still excited, in that this brings us one step closer to the three-dimensional reincarnation of Chapter IV: A New Hope; the movie that started all the fuss – albeit in a simpler, less digitally-enhanced, version, a long time ago (yup; in a galaxy far, far away…). As for the 3-D conversion of Episode One, it’s clear that it’s a quality job, but the 3-D has been deployed in a subtle fashion. Now, whilst I understand that 3-D doesn’t always have to be in-one’s-face, there’s been a huge build-up, over the years, about the Star Wars 3-D conversion – and this is, after all, a matinee-style sci-fi franchise. Couldn’t we have had a tad more fireworks in the stereoscopy department?